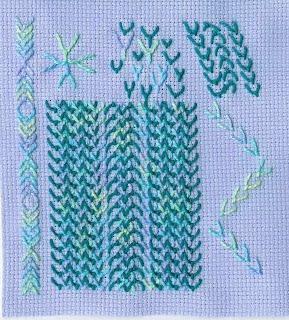 Here's my fly stitch sample for TAST . I enjoyed building up geometric patterns with this which is why I did the bigger section - I just wanted to keep going! I should dig out some different fabric for the next one though as my samples are all starting to look a bit the same. I've also managed to complete a few pages today for my fan sketchbook for my Creative Sketchbooks course. It's finally starting to come together though there's a way to go yet.